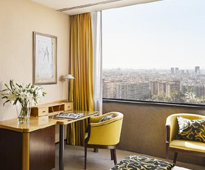 Set in 25,000 square meters of breath-taking 19th century gardens and revealing an unparalleled view of the stunning Barcelona skyline; this luxurious urban hotel provides guest with a tranquil retreat in the heart of Barcelona, Spain´s celebrated second city. 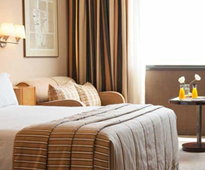 With a central location on the prestigious Avenida Diagonal and excellent transport network in addition to the offered two-way free shuttle service between the hotel and the city centre, Fairmont Rey Juan Carlos I excels at being a distinguished hub for business as well as a notable site for exploring Barcelona and wider Catalonia. With 24 meeting rooms within its walls – all including state-of-the-art technology – the hotel also features three elegant garden salons ideal for gala dinners, business lunches and banquets. 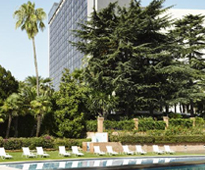 Furthermore, the Palau de Congressos de Catalunya convention centre which belongs to the same remarkable resort as Fairmont Rey Juan Carlos I is just a short walk away. This world-class, state-of-the-art complex comprises 38 halls and meeting rooms, 43,000 square feet of exhibition space, and an auditorium for up to 2,000 delegates. The building which is a symbol of contemporary Barcelona was designed by the architects Ferrater and Cartañá and received the National Architecture Prize in 2001. The Palau hosts the most important events and conferences in Barcelona and offers an wide variety of services and numerous of facilities for its guests.